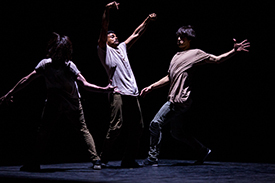 Breakin’ Convention, a Sadler’s Wells project, has announced the return of exciting and innovative projects for emerging artists, with a range of development opportunities and public performances. These far-reaching initiatives exhibit Breakin’ Convention’s commitment to supporting hip hop dance, both in the UK and internationally. Open Art Surgery will go to Malta for the first time in December. Marking its final month as Europe’s Capital of Culture, Malta’s capital Valletta will host Open Art Surgery as part of its Hip Hop Weekend. Open Art Surgery is a week of workshops for aspiring hip hop choreographers, mentored by Jonzi D and culminating in a performance at City Theatre in Valletta, where the audience input their feedback directly to the artists involved. Jonzi D will mark the occasion with an exclusive 15 minute performance of Aeroplane Man. Back in the UK, Breakin’ Convention will team up with RCT Theatres and Avant Cymru to present Open Art Surgery in Wales for the first time. Raw talent is showcased with the creation of new work, allowing performers to take creative risks, try something different and test ideas. Open Art Surgery will also take place in London, with a performance at Sadler’s Wells’ Lilian Baylis Studio in March. Back to the Lab returns with world premiere public performances at the Lilian Baylis Studio in January. Four promising choreographers – Joshua Nash, a Far From the Norm artist whose credits include Channel 4’s Random Acts, Crying Out Loud and SiDance Festival; Nicole McDowall, who has danced with Boy Blue Entertainment’s BLAK WHYTE GRAY, Myself UK Dance Company and Spoken Movement; Ben Ajose-Cutting, part of The Locksmiths, who performed with the 15 piece sonic orchestra at Breakin’ Convention 2018, and international duo Hector Plaza and Agnés Sales Martín from Barcelona who have danced with Iron Skulls Co – will experience two weeks of intensive training, workshopping and mentoring by established choreographers to enhance their skills. Future Elements gives a group of talented young aspiring film-makers, MCs and dancers aged 13 – 16 the chance to workshop and collaborate to create an original music video. The end result encompasses lyrics, choreography, producing music, creating artwork and directing. Screened to the public in an exclusive evening in March in the Lilian Baylis Studio, tickets go on sale early in 2019.